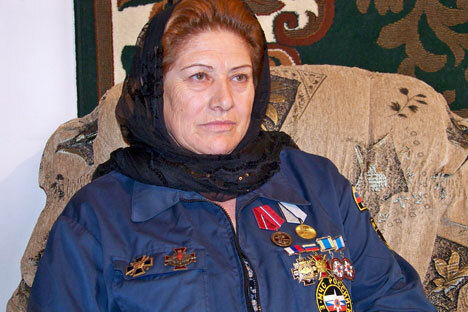 For over four decades, Zina Nanayeva drove her heavy KamAZ along the steep roads of the Caucasus through two Chechen wars, saving soldiers' lives and delivering food supplies. This is how 62-year-old Nina Nanayeva remembers the streets of Grozny, the Chechen capital, during the First Chechen War of the mid-1990s. Nowadays Nanayeva works as a truck driver at the regional department of EMERCOM, the Ministry of Emergency Situations. But in the last two decades, she has driven through two wars, delivering food supplies under fire and saving soldiers' lives. During the first Chechen war Zina was a beacon of light for many. After the city’s water supply was destroyed, she delivered fresh water to the old people's home, a church and two hospitals, skilfully manoeuvring among the ruined houses demolished by the armoured vehicles. One winter day in1995, a day that could have been her last, has stuck in Zina's memory. On February 3, she went to nearby Hospital No. 9 to visit a neighbour. Slipping from basement to basement in short spurts, she was detained by a military scouting group. At the time, women snipers were known to operate in Grozny. The hunt for Russian soldiers paid well. “They looked at me, wearing camouflage trousers and a coat belonging to my policeman brother. My driver's license, the vehicle test certificate and the pliers I used to open basement doors bulging in the pocket. I didn't look a bit like a peaceful Chechen woman. War justifies its own code,” says Zina. Two years on, Vahid and Zina met in the ruins of Grozny. “The Colonel obviously didn't trust a man from the diaspora,” says Zina.“Instead he asked me: ‘What make of car do you drive? See that Ural over there? Get behind the wheel, take off! Show me your driving skills.’ It was pretty muddy and slushy. And it was the first time I had driven an Ural, with its complicated and unorthodox mechanics. Driving on the war-blighted roads across the region brought Zina and her truck into the very thick of it. Time and again the truck was shelled and its tires punctured. Driving her truck along the mountain roads, Zina rescued many wounded soldiers. Left to die in gorges, their legs broken, they no longer knew where the front line was. “What are we doing here? What are we fighting for?” the young conscripts would ask themselves as they were carried to the hospital in Zina's KamAZ. “I bandaged them, wrapped them in quilted jackets, and fed them on goat's milk bought from the locals. I brought them straight to the EMERCOM office and handed them over to Médecins Sans Frontières. The boys called me their true mother, murmuring the words through their parched, blood-stained lips,” says Zina. A regular army detachment was quartered near the EMERCOM office. Zina used to ask the soldiers if they needed anything: “Anything you want but vodka.” They were quite thrilled to get those cheap sweets, or even chocolate – that was a big deal. The soldiers trusted Zina to be their good luck charm. When they needed to go to the market place they always asked her to accompany them, their talisman. Zina made them feel safe and reassured. Another day she recollects was the day of December 31, 2000. The Chechen EMERCOM office received New Year gifts that had been collected by children all over the country. The bags full of sweets also contained hand-made toys, drawings, dolls and toy cars. The gifts had to be delivered to the upcountry districts of Chechnya. The Shatoy district - ninety kilometres from Grozny, up along a series of hairpin mountain bends- was listed among the most disturbed areas. It was Zina Nanayeva who volunteered for the job. “Being a woman, I am meant by God to bring grace and beauty into this world. Besides, I was driving an off-road military truck. When I came to the mayor's office in Shatoy, the party had already begun – tables laid, the fir tree decorated and the children reciting poetry,” says Zina. Even as a young girl, Zina dreamed of driving a KamAZ. She used to drive along the mountain roads in her dreams at night. When she first found herself in the cab of a heavy truck, she took off at once. And 43 years later, she has never stopped.